I finally started playing around with the Hello Kitty Sizzix embossing folders I purchased a while back. I usually emboss on white core cardstock and sand the raised area to highlight the design, but this time I decided to emboss on the pieces of vellum and pearlized paper I had in my scrap drawer. I really liked the look of the embossed pearlized paper. I discovered the HK embossed flower frame fit exactly on a standard card blank. To match the pearlized paper I rubbed a little Lumin Arte powder (grapefruit) on the card after embossing. 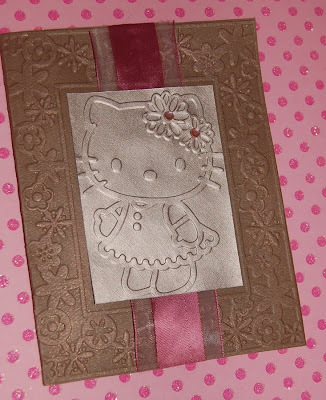 (The Hello Kitty character design is from a different embossing set than the frame.) 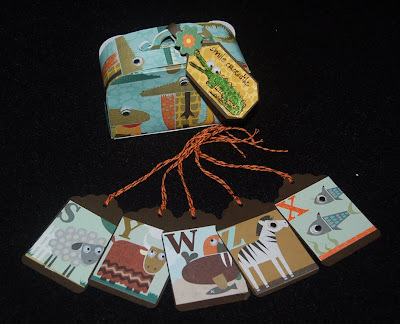 The hardest part of making this card was choosing the right ribbon from my boxes of live ribbon hatchlings. You know what I mean about those multiplying ribbon babies. If you don't understand how anyone can have a ribbon collection then you aren't a REAL crafter. Anyway, besides being obsessed with Hello Kitty designs, I think that I am an incurable chocoholic. As I was making this card I started visualizing a fantasy box of Hello Kitty.chocolate cherries. Don't you think that this card design would make a good box cover for chcolates? How about it Sanrio? Okay now I HAVE to eat that last piece of chocolate cherry cordial. MMMMM-mmm-m-m Hmm-m-m maybe I can recycle my real chocolate box into something LOL. My husband's brother and family went to Japan and brought back some tasty food gifts for us. As much as I enjoy the treats, I was just as excited about the wrapping paper that was around the Castella cake. Something about Asian graphic designed paper makes it impossible for me to throw away Japanese wrappers. Ah, so then I thought the Castella wrapping paper would make a very clever background for a thank you card for the cake and other goodies. The photo shows how I incorporated a stamped Hero Arts image of a kokeshi doll with the wrapper. 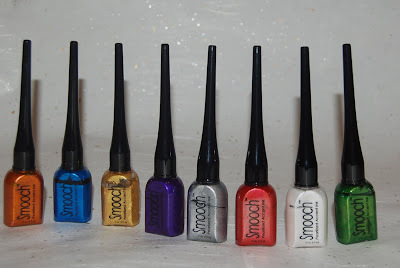 To make the image stand out I colored the semi-glossy cardstock with markers and gold Smooch ( a new metallic paper paint that comes in a small nail-polish- sized bottle sold at Ben Franklin Crafts) and then raised it up on pop-dot adhesives. Adding a strip of origami paper and a torn piece of washi paper with a 'thank you' sticker finished off the easy recycled wrapping paper card. I hope that this has given you some ideas for going GREEN with your card crafting. 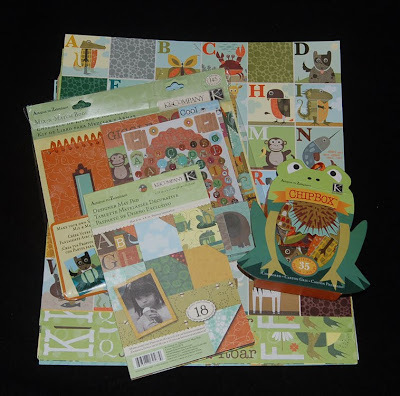 About the same time that I purchased the Sizzix suitcase box die cutter (from BFC) I also bought several 12x12 cardstock sheets, paper booklet, chipboard set, and album kit of K and Co. in the new animal alphabet designs. When thinking about which paper to use with the suitcase die, I realized that the crocodile (or is it an alligator?) design would be a funny one to use because of the association with bags/shoes made from their leather. I cut the design out wrong (twice!) because the Sizzix instructions were for solid colored paper not cardstock with one-sided designs......so think carefully before you cut. (You should only need one 12x12 sheet to make the box.) After assembling the box I glued on googly eyes and made the luggage tag by stamping a Hero Arts crocodile stamp (from a clear set) and the words 'Smile Crocodile' (from the same stamp set). The mustard colored crocodile skin paper used for the tag was cut from another sheet of K and Co. paper (the one with the alphapbet animal squares). Because the paper was glossy and the air in Hawaii humid the Smooch green ink did not dry quickly and took a full night to set. I attached a tiny strip of adhesive velcro to the luggage tag strap so that it can be removed and reattached. The flower is from the box of chipboard pieces that is also from K and Co. To fill the box as a party favor you can always use candy but I think for a crafting party maybe you could give gift tags (like the ones shown here made from alphabet squares) or small gift cards. Right now Ben Franklin Crafts has a boatload of super cute erasers which could be used to fill the suitcase for a young boy's party. SALES! When shopping at Hilo Ben Franklin Crafts I came upon a Swarovski crystal sale. Packages of 100 crystals were selling for 40% off. Since I use the crystals often in my jewelry I bought lots of them. Remember you get the craft club discount too. I'm not sure how long this sale lasts and if you miss the crystal sale, you can still find bargains at the red tag clearance this week. Unbelievably, anything with red tags (which means items are already on sale) are sold at an additional 50% off. I found some terrific semi-precious bead strands that were a deal at 50% off and this week you can buy them for an additional 50% off. They are almost free! Be sure you get in on this super sale. There are other items on 50% off red tag so go check out the bargains! Okay, I hope that you are happy that you visited this blog site and that you'll come back again to see what I have to say or show. Thanks! A few weeks ago I was shown some unique wooden boxes selling at Ben Franklin Crafts. They are made of a thin, light-weight, veneer like wood. The way that the top rolls over reminds me of an old fashioned roll top desk. 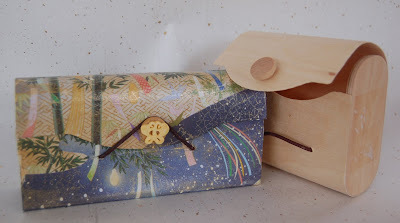 I thought that decoupaging Kodomo scrapbook paper over the box might make it look like a piece of lacquer wear. (I used Mod Podge matte decoupage medium.) I thought that the outcome was good but I had a few wrinkles in the paper due to the flexibility of the box cover. I used a crackle design rubber stamp and Brilliance galaxy gold ink to cover the wrinkles and give the box a more ancient look. I glued a carved bone button bead onto the wooden knob. The boxes from Sierra Pacific come in two sizes and are quite inexpensive. I think that they would make great party favor goodie boxes. Any kind of medium weight scrapbook paper (maybe fabric) should work. I will try to write up project instructions for this box on our website (http://www.bfcraftclub.com/). However, this project is so easy you can probably figure out how to do it yourself. Keep crafting and smiling! Today is our wedding anniversary and so I gave my husband an origami card.....handmade of course! 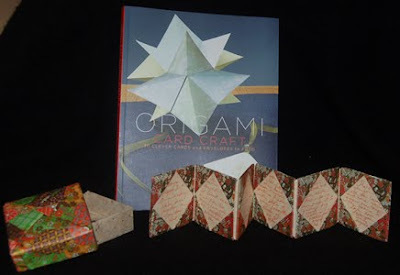 I found the instructions for the card and box in the new book, Origami Card Craft by Karen Thomas. This book is packed with great cards and envelopes to fold from origami or scrapbook paper. I met the author of the book once at a craft show and she is really a nice person. Her instructions in the book are easy to follow and result in cleverly folded projects. I wrote my anniversary message inside each opening of the picture frame and my husband can fill the frame with his favorite photos. My message will be secretly hidden in the frame. I like the fact that the box is exactly the right size for the frame card. Many packs of origami paper have multi-designed papers and may not contain six of the same design so you can use similar designed paper or cut the 6" squares from large sheets of washi paper. Some thing about folding origami and making something 3-D from a square of paper is very satisfying. It is also satisfying to make a unique card, especially when you've been married as long as we have and it becomes hard not to make the usual ho-hum anniversary card. Happy Anniversary Sweetie! If you've been reading my blog for awhile you know that I love poking around in antique shops and pawing through stuff at flea markets. I'm not sure what forces make it impossible for me to resist vintage items with what I call 'possibilities', but I do know I search everywhere and I've found treasures (maybe only to me) in unexpected places. 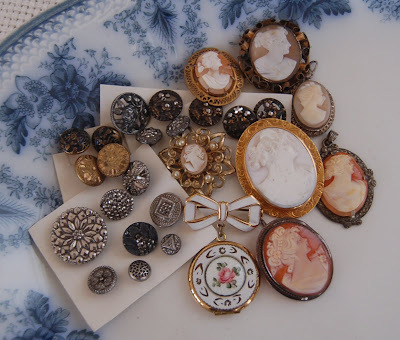 Recently, a trip to Boston yielded several old cameos (all less than $20, except for the largest one) which I plan to incorporate into one-of-a-kind jewelry. A search in a big red barn called 'Oldies' was rewarded by a cache of antique buttons sewn onto strips of paper and priced about $1 each. Some of the buttons will be used in jewelry and some will be used for impressing silver Art Clay to make fine silver beads. The blue and white platter is one of my favorite purchases of the trip because it was a bargain and a collectible turn-of-the-century piece that is a marked 'flow blue' with an impressed rim....just the kind of piece I love! Maybe now I NEED to bake some cookies or scones to serve from the platter. M-mmm-m-m! There are so many wonderful collectibles and affordable antiques everywhere that you just need to keep your eyes open and think of the possibilities. Like most crafters, when someone gives me a gift wrappped in pretty paper I never throw it away. Usually I save the wrapping to wrap another gift but sometimes the paper has too many creases and worn spots where the tape was. I started thinking that I would cut pieces of the lavender paper with gold and silver threads and make a splendid thank you card to give to the person who gave me the gorgeously wrapped gift. The paper looked like butterfly wings so I started looking in my bin of butterfly and garden things. I discovered an old rubber stamp of a fairy with butterflies and thought that it might be just the image I needed. I colored with markers and watercolor pencils until I got the effect I wanted. 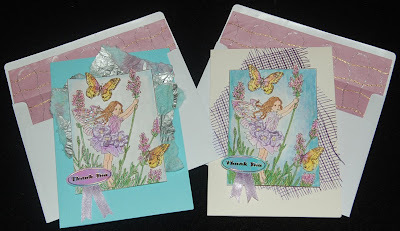 I colored and glittered another butterfly rubber stamp image to layer a prettier butterfly over the first one. I used foam dots to raise the images off the card. Ribbon (from the gift) and mini artificial flowers added more dimension. By setting the image on different colored blank cards and using different textured elements (hand marbled tissue on one and woven sisal on the other) I was able to give the similar cards individual appearances. In the end I didn't use the gift wrapping paper on the card but used it to line the envelope. I think lining envelopes gives elegance to handmade cards and careful tracing of the envelope makes it possible to make use of even less-than-perfect paper (just hide the flaws inside the envelope). Reusing gift paper and ribbon is one more way to Craft Green! Thanks for visiting this site. See you again.....soon! I designed this necklace as a gift for a young girl and kept it simple because her taste in jewelry seems to be elegant but simple. Also I needed to complete the project in one evening. The gemstone choice of amazonite was an easy one because I saw her wearing earrings of a similar color and the light turquoise color reminds me of the sea at summertime. I used a goldfilled chain designed to pass through most bead holes. You could probably use a gold plated beading wire but I don't think it would drape as well as the chain. Because there are few beads used and amazonite is not terribly expensive, the cost of the bead chain is not going to break your budget. 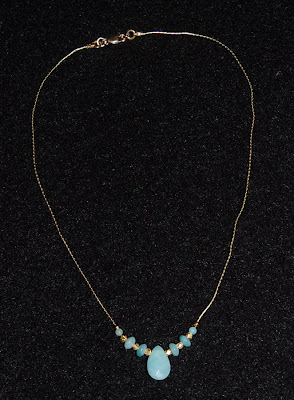 I will eventually write up and post the instructions for this necklace on our craft club website (http://www.bfcraftclub.com/). I hope that you will try making this necklace before the summer is over. If you are a novice beader you will see how easy and economical it is to make gifts for all your girlfriends. Why not start early to make jewelry for Christmas gifts? Thanks for stopping by and reading this blog.